With 4 isolated channels and up to 7 hours of battery life, the lightweight THS3000 Handheld Oscilloscope Series enables you to safely make floating or differential measurements on your bench or in the field. Now you can tackle tough environments with the performance you expect from Tektronix – safely and affordably. With up to 100 MHz bandwidth, 4 channels, and 2.5 GS/s maximum sample rate, no other oscilloscope offers as much bandwidth and sample rate in a portable handheld form factor. The THS3014 Handheld Oscilloscope Series has 10,000 points record length per channel, enabling you to capture more signal information at higher sample rates to clearly see signal details. For applications where it is important to measure slow-changing signals over long time periods, the THS3000 Series offers Roll mode that extends the record length to 30,000 points of signal information. To enable floating measurements, the THS3000 Series is architecturally different than most other oscilloscopes. All input channels are fully isolated from the main chassis and from each other. Additionally the power adapter and USB interface are fully isolated to ensure safe measurements and eliminate the risk of unintentional grounding or accidental short circuits. When configured with the proper probes you can be assured you’ll be able to make quick, safe, and accurate measurements. The THS3000 Handheld Oscilloscope Series is packed with analysis tools to help you validate your device’s operation and identify issues quickly. With waveform math, you can add, subtract, or multiply any of your signals to investigate instantaneous power or look at gain. Vertical and horizontal cursors allow you to look at a specific point on your waveform for accurate measurements of voltage, current, time, or frequency. With 21 automated measurements, you can make common measurements quickly and accurately. The built-in Fast Fourier Transform (FFT) function allows you to see the frequency spectrum of your signal, revealing signal interference, crosstalk, or switching noise. Measurements on power conversion electronics usually require probes with higher voltage ratings. Tektronix offers a passive probe with insulation systems specifically designed for making floating measurements. The THP0301-X can measure up to 849 Vp-p (300 VRMS). Optional P5122 probes, when coupled with the THS3000 Series, are suitable for making measurements on 1000 VRMS devices in Category II environments, with a maximum float voltage of up to 600 VRMS relative to earth ground. 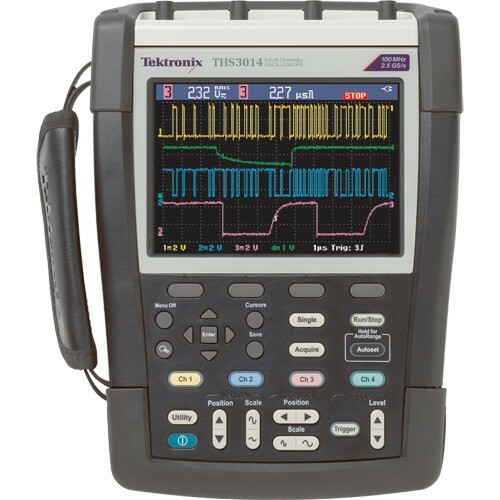 The THS3000 Handheld Oscilloscope Series has a front-panel layout and an intuitive user interface which makes the instrument easy to use, reducing learning time and increasing efficiency. For initial setup or for situations where you’re constantly changing connection points, the THS3000 Series has a single-button Autoset and Autorange feature which can automatically set up the trigger system and adjust vertical and/or horizontal oscilloscope settings. The bright color display makes it easy for you to see the signals you’re measuring. Each waveform is color coded and designed to correspond to the colors on the input probe connectors, the front-panel channel selector buttons, and the individual probes which are colored at both ends. By matching the colors during setup you’ll be assured you can easily identify your waveforms.